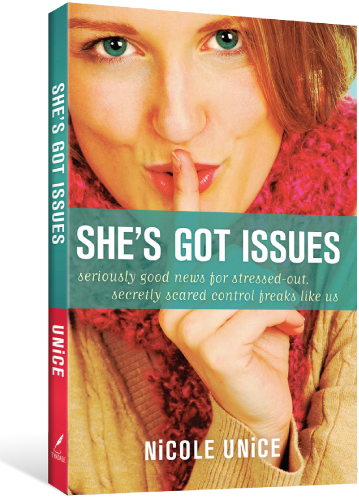 Perhaps it was the fact that I had experienced a tough weekend with work, home, and life issues factoring in to one stressed out Monday morning that drew me to She’s Got Issues, the latest book by Nicole Unice. Perhaps it was simply the creative cover and subtitle text that caught my interest. Wow—I am not the only one hiding my control freak issues? “Seriously good news” was something that I could seriously use. What did I think of She’s Got Issues by Nicole Unice? A summary of She’s Got Issues. She’s Got Issues by Christian counselor and busy mom, Nicole Unice, addresses a laundry list of the many issues women face today as they struggle to micromanage their dream lives, perfect images and perfect families. From anger management, fear and control issues to measuring up—both physically and in true, “keeping up with the Joneses” fashion—Unice tackles a host of real life, every-day issues that turn a woman’s ideal life into one of chaos and turmoil. Do you have issues? While we may not have all of the noted issues in Nicole Unice’s book—most women seek to conceal at least a few. As readers venture through She’s Got Issues, the author provides journaling exercises, personal prayers, group discussion ideas and even additional resources and activities via a smart phone scan at the end of each chapter. Readers may also access these additional resources at the book site directly. She’s Got Issues sheds light on the secrets that we are not really keeping. Unice serves up chapter after chapter of real women dealing with daily life. Some deal more effectively than others while some fail to deal” at all. I have issues. I try to keep it all together and display the “proper” images that I wish were ever present. I think—deep down—I thought that I was keeping my “issues” a secret. Unfortunately, like some of Unice’s real life ladies, my issues either erupt outwardly—or internally fester—affecting many of my interactions, relationships, and activities. She’s Got Issues is not a self help book or guide to recovery. If you seek a step by step guide to fixing your issues, this is not that guide. It is, however, a start to recovering from an issue-plagued life. Admitting issues are the first steps. She’s Got Issues encourages readers to explore their own personal issues and analyze the impact of those issues on day-to-day living. Unice encourages readers to explore a stronger relationship with God as a means of strength in dealing with personal “issues”. Final thoughts on She’s Got Issues. It was a difficult read for me—maybe because my mindset was not particularly focused at the time. I found myself skimming the book rather than reading each word. I think my free time and attention span was a little short for the longer passages and sections. This is another book that does not offer a quick fix answer to life's problems—but, offers some of the reasons for our issues and encourages us to examine, realistically, our spirituality, our lives, our goals and our future. If you are struggling with issues—you may relate all too well to sections of She’s Got Issues. If you think you do not have issues—She’s Got Issues may open your eyes to some problems that you even try to hide from yourself. Check out the She's Got Issues book website. Disclaimer: While I frequently receive complimentary review copies from publishers, including Tyndale Books, I purchased the book for this review myself. All opinions are my own and are not influenced by the author or publisher. Hey Angela! Thanks so much for taking the time to review the book. And THANK YOU especially for recognizing that it's not a self-help book, but an opportunity for all of us, as you say, to "examine, realistically, our spirituality, our lives, our goals and our future."